Showing items in category Tasmania, sorted by newest listed first. 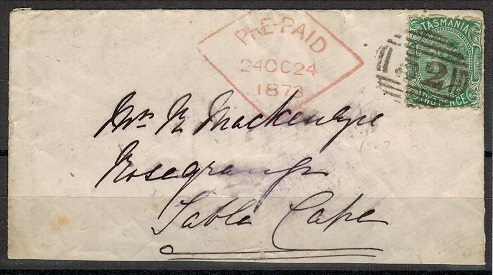 AUSTRALIA (Tasmania) - 1873 2d rate cover to South Africa struck '52' and PRE-PAID. 1873 (OC.24.) 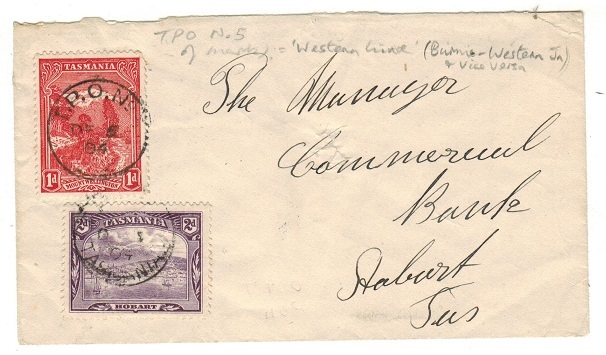 cover addressed to Table, Cape bearing 2d green adhesive tied by '52' duplex of Launceston with red PRE-PAID diamond shaped h/s at left and part WYNYARD/TASMANIA b/s. AUSTRALIA (Tasmania) - 1881 8d rate cover to UK used at GEORGE TOWN. 1881 (NO.3.) 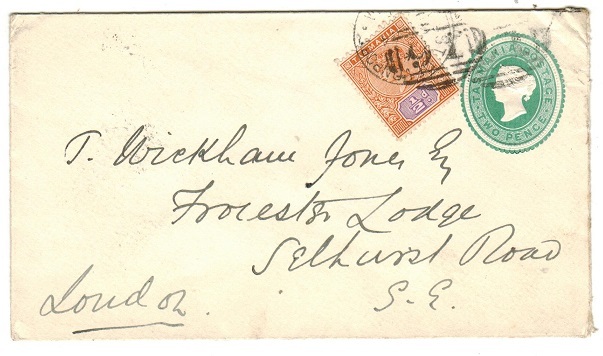 pretty envelope (ex flap) addressed to UK bearing 2d (corner fault) and 6d adhesives (SG 135+157) tied by '37' duplex strike with neat GEORGE TOWN double arc cancel alongside. Marked in manuscript 'Via Brindisi' and complete with original contents. AUSTRALIA (Tasmania) - 1885 LETTER BILL letter sent from BRIGHTON STATION. 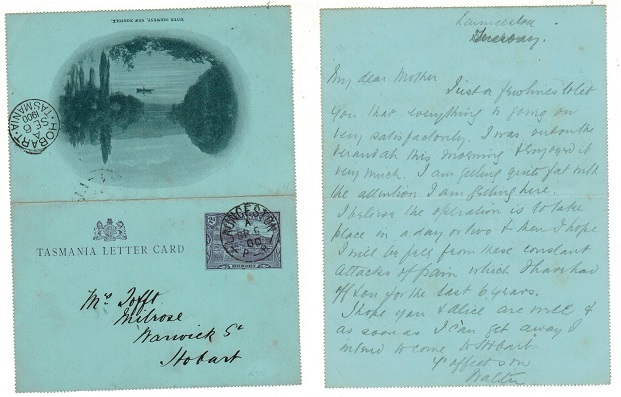 1885 black on pale blue LETTER BILL (Form D-3) folded into a letter and addressed for 'Mail For Gleen Ponds' cancelled inside by a rare strike of the BRIGHTON STATION/TASMANIA cds dated DE.11.85.Brighton being a small town west of Hobart. 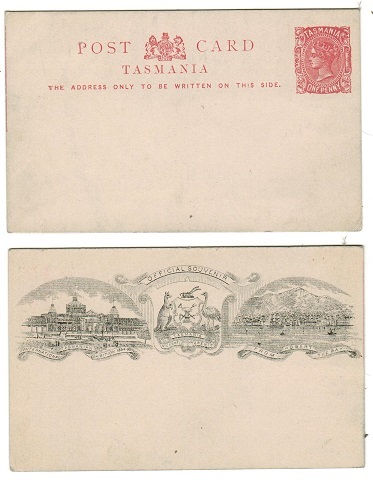 AUSTRALIA (Tasmania) - 1870 ON PUBLIC SERVICE envelope used locally. 1870 (MR.30.) 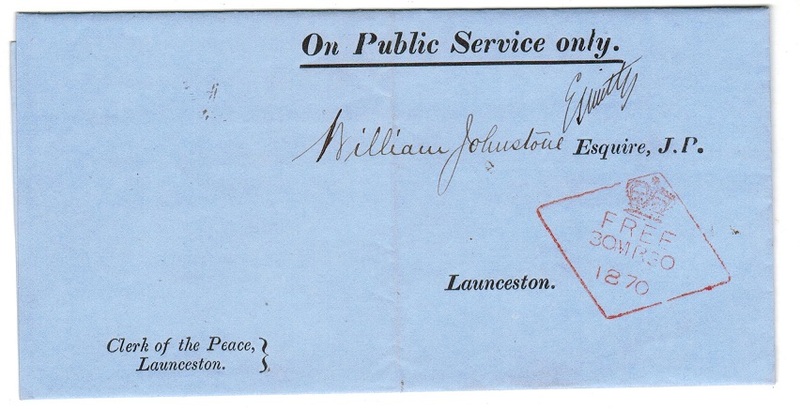 stampless black on blue ON PUBLIC SERVICE ONLY entire from the Clerk of Peace at Launceston addressed locally and struck by a lovely strike of the red crowned FREE h/s. R.Lowe type HS35. 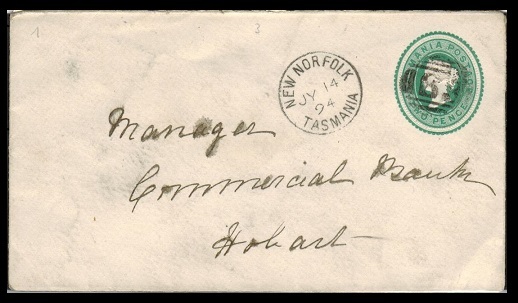 AUSTRALIA (Tasmania) - 1883 2d green PSE used locally at NEW NORFOLK/TASMANIA. H&G 1. 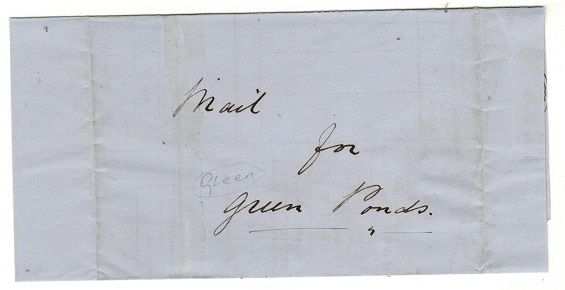 1883 2d green on cream postal stationery envelope (H&G 1) addressed locally to Hobart and cancelled by '83' duplex with s/r NEW NORFOLK/TASMANIA 'proving' cds alongside dated JY.14.94. 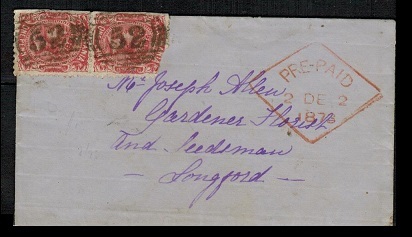 AUSTRALIA (Tasmania) - 1895 1d pink PSC underpaid to Melbourne struck LOOSE SHIP LETTER. h&g 7A. 1895 1d pink on cream postal stationery postcard addressed to Melbourne cancelled by black boxed LOOSE SHIP LETTER h/s. The card was under paid and has oval 'T 1d' tax mark applied with 1d 'Postage Due' added on arrival cancelled by smudged cancel and with MELBOURNE arrival b/s dated 17.2.02. H&G 7a. AUSTRALIA (Tasmania) - 1873 2d rate local cover with '52' duplex of Ross applied. 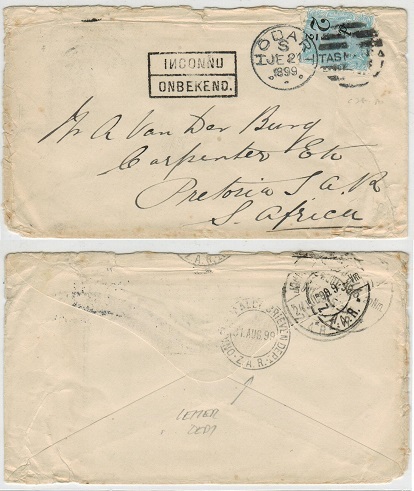 TRANSVAAL - 1899 inward cover from Tasmania with INCONNU h/s applied. 1899 (JE.21.) 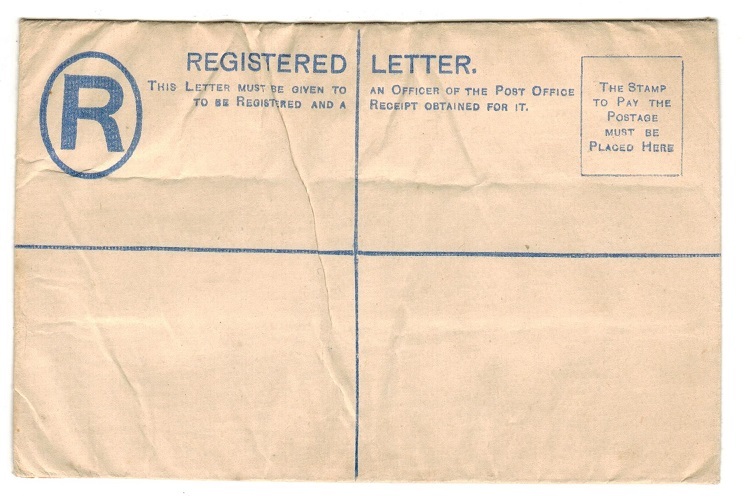 inward cover from Tasmania bearing 2 1/2d surcharge on 9d adhesive tied HOBART (edge creases) with scarcer BRIEVEN DEPT/ZAR letter office b/s having been undelivered and struck on the front by boxed INCONNU/ONBEKEND. AUSTRALIA (Tasmania) - 1900 2d violet illustrated letter card used at LINDISFARNE. H&G 2(1). 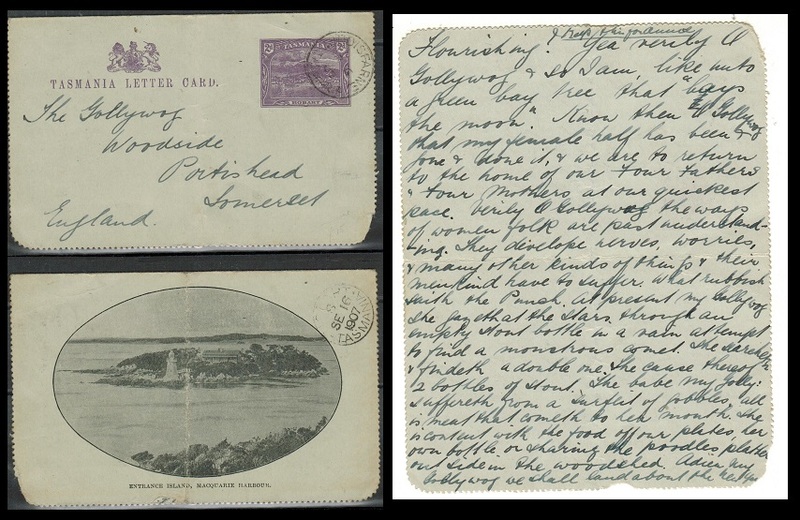 1900 2d violet of pale green 'Tasmania Letter Card' addressed to UK with illustrated view on reverse side depicting 'Entrance Island, Macquarie Harbour' cancelled by s/r LINDISFARNE/ TASMANIA cds dated SP.6.05. The card has an unfortunate vertical fold but is a scarce piece of stationery and with a long message inside. H&G 2(1). 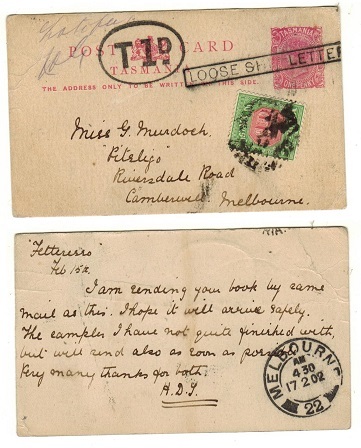 AUSTRALIA (Tasmania ) - 1900 2d violet illustrated letter card used at LAUNCESTON. H&G2(6). 1900 2d violet on pale green letter card addressed to Hobart depicting 'River Derwent, New Norfolk' tied by LAUNCESTON cds dated SP.5.00. H&G 2 (6). 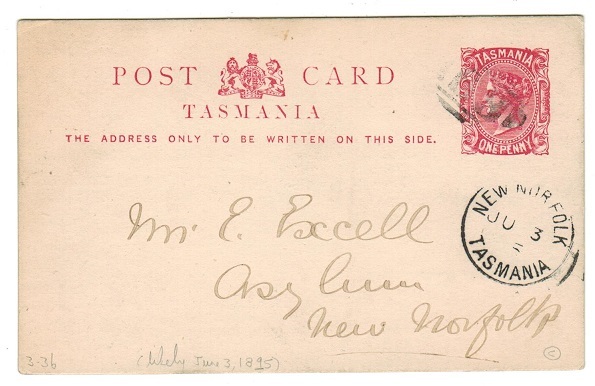 AUSTRALIA (Tasmania) - 1904 3d rate local cover used on T.P.O.No.5. A scarce railway strike. 1904 (DE.6.) 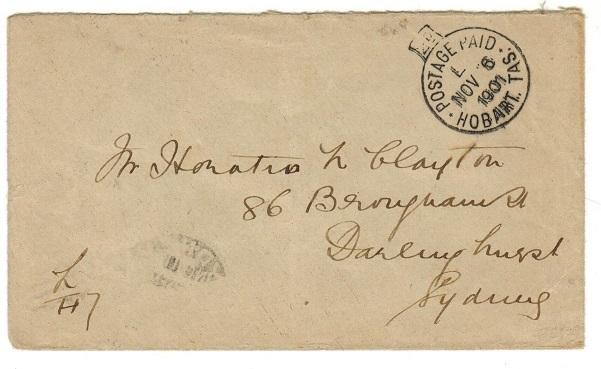 cover addressed locally to Hobart bearing 1d and 2d adhesives tied by T.P.O. No.5/ TASMANIA cds used on the Western Line (Burnie-Western Junction). AUSTRALIA (Tasmania) - 1903 2d rate local postcard carried by T.M.L.RY-No.3. Scarce railway strike. 1903 (DE.24.) 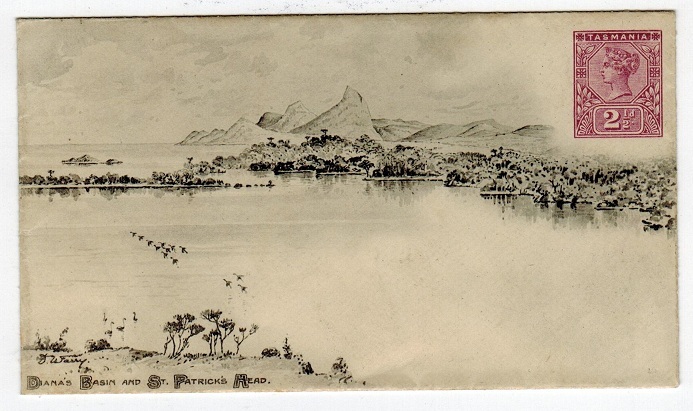 postcard use to Bream Creek via Hobart bearing 2d adhesive tied by T.M.L. Ry-NO 3/ TASMANIA cds with BREAM CREEK arrival cds below. A scarce Railway usage. AUSTRALIA (Tasmania) - 1883 2d green PSE used locally from MACQUARIE PLAINS. H&G 1. 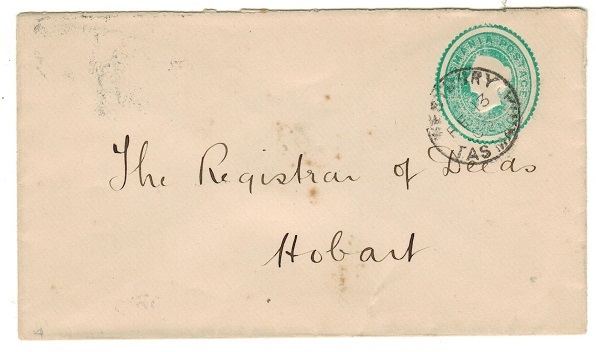 1883 2d green on cream postal stationery envelope addressed locally to Hobart cancelled by '56' duplex with MACQUARIE PLAINS 'proving' cds at left. H&G 1. AUSTRALIA (Tasmania) - 1907 postcard use to Italy used at DEVONPORT WEST. 1907 (OC.28.) 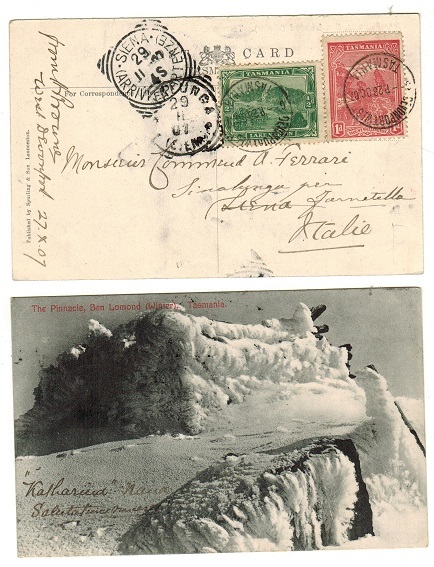 use of picture postcard addressed to Italy depicting 'The Pinnacle, Ben Lomond, Tasmania' bearing 1/2d and 1d 'view' adhesives tied by DEVONPORT WEST/ TASMANIA cds's. AUSTRALIA (Tasmania) - 1901 stampless cover to Sydney cancelled POSTAGE PAID/HOBART. 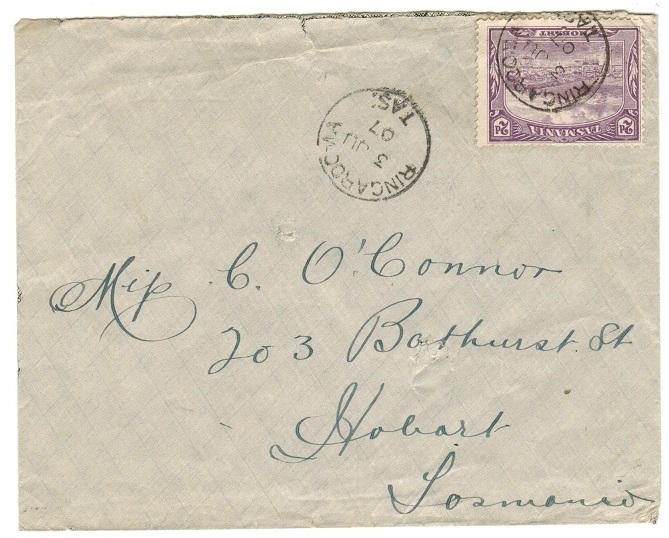 1901 stampless cover addressed to Sydney cancelled by very fine crowned POSTAGE PAID/HOBART cancel dated NO.6.1901 with 'L' coding. AUSTRALIA (Tasmania) - 1882 2d green uprated PSE used at DEVONPORT. H&G 1. 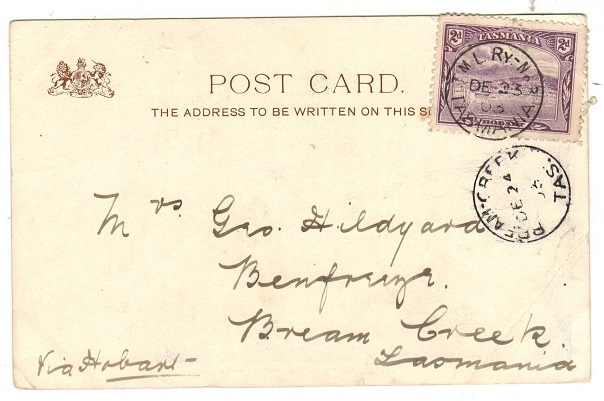 1883 2d green on white postal stationery envelope addressed to UK bearing additional 1/2d adhesive and cancelled by DEVONPORT/TASMANIA cds dated SP.24.94. LAUNCESTON b/s. H&G 1. AUSTRALIA (Tasmania) - 1892 2d green 'Privately Printed' PSE used at WESTBURY. H&G KB4. 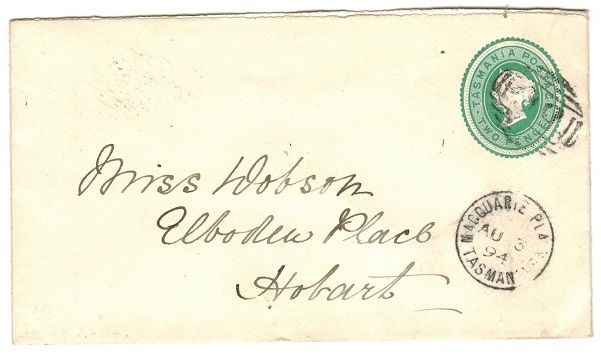 1892 2d green on cream 'Privately Printed' postal stationery envelope (rounded flap) addressed to Hobart cancelled WESTBURY/TASMANIA and dated FE.13.05. Scarce. H&G KB4. AUSTRALIA (Tasmania) - 1884 1d orange red PSC with INTERNATIONAL EXHIBITION illustration on reverse. 1884 1d orange-red on white postal stationery postcard in fine unused condition with OFFICIAL SOUVENIR/INTERNATIONAL EXHIBITION illustration on reverse. H&G 5. AUSTRALIA (Tasmania) - 1900 (circa) WALCH 'privately printed' PSC unused. 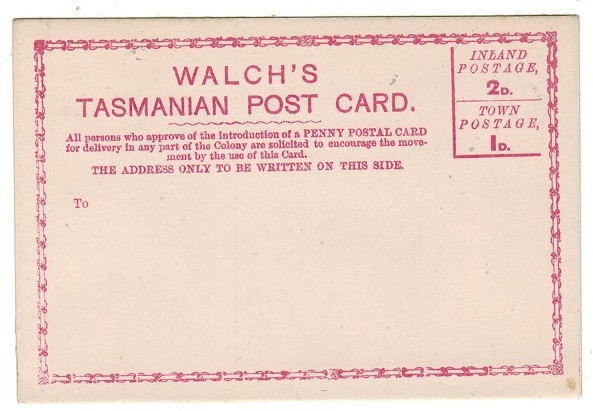 1900 (circa) red on white privately printed WALCH'S/TASMANIA POST CARD. Fine unused. AUSTRALIA (Tasmania) - 1854 entire bearing 4d 'Van Diemens land' adhesive. 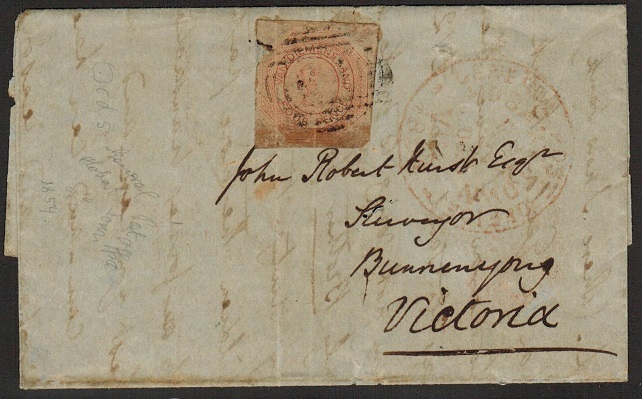 1854 entire addressed to Bunnenyong in Victoria bearing 'cut square' 4d 'Van Diemens Land' adhesive (SG type 2) tied by weak duplex cancel ('V' cut at left side) with large red GENERAL POST OFFICE/HOBART TOWN/VDL crowned h/s at right. (RL type 6). Red SHIP LETTER/FREE/VICTORIA backstamp and with BUNNYENYONG/VICTORIA arrival dated OC.19.1854. Fragile and with some faults to the adhesive due to age and light central fold. A scarce early ship letter however and a elusive use of this scarce stamp from plate 2 with blurred and coarse engraving. 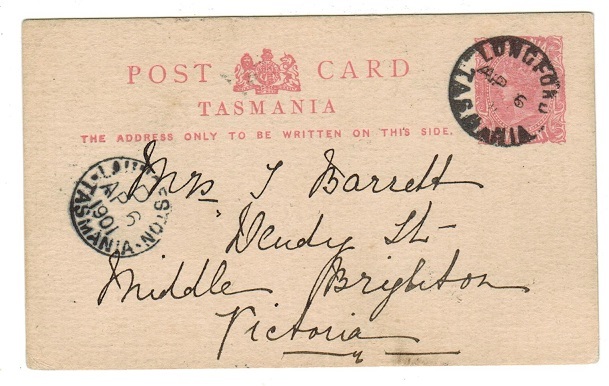 AUSTRALIA (Tasmania) - 1904 (circa) postcard bearing 1 1/2d on 5d surcharge used at LAUNCESTON. 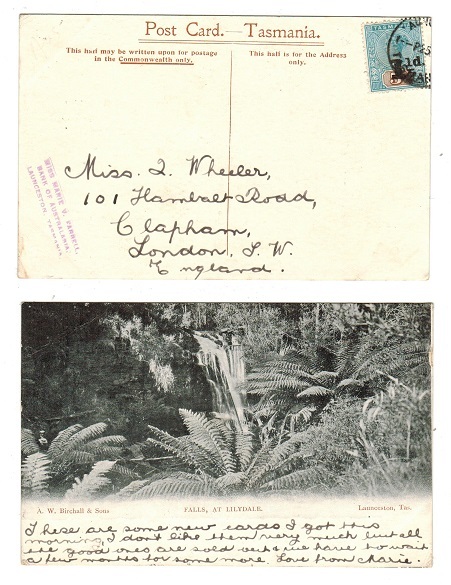 1904 circa use of picture postcard addressed to UK depicting 'Falls at Lilydale' bearing 1 1/2d surcharge on 5d pale blue and brown adhesive (SG 244) tied by part LAUNCESTON cds. 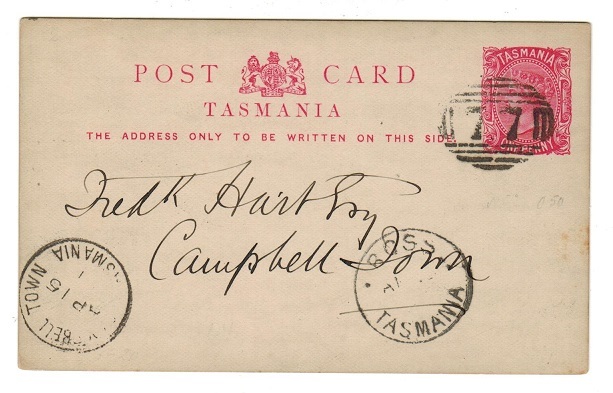 AUSTRALIA (Tasmania) - 1904 1d PSC used locally from EAST DEVONPORT. H&G 9c. 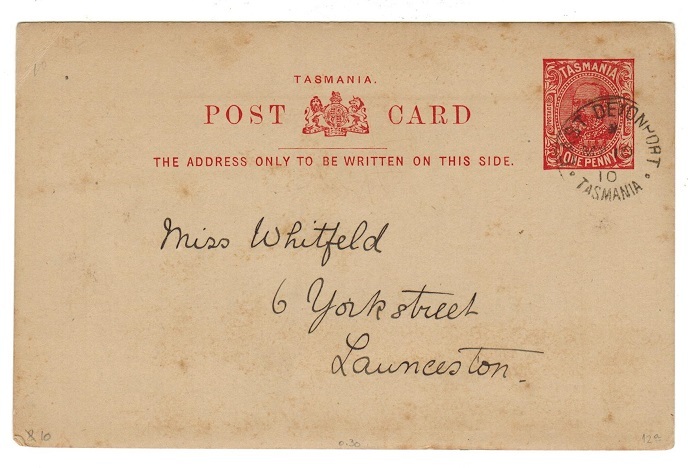 1904 1d scarlet red on buff postal stationery postcard (some light tone spots) addressed locally to Launceston cancelled by very fine s/r EAST DEVONPORT/TASMANIA cds dated MY.10.10. H&G 9c. AUSTRALIA (Tasmania) - 1884 1d PSC to Victoria used at LONGFORD. H&G 3c. 1884-1902 1d pink on white postal stationery postcard addressed to Victoria cancelled by LONGFORD/TASMANIA cds dated AP.6.1901. H&G 3c. AUSTRALIA (Tasmania) - 1884 1d PSC used locally from ROSS. H&G 2. 1883 1d carmine rose on cream postal stationery postcard addressed locally cancelled by '77' duplex with ROSS/TASMANIA proving cds below and with CAMPBELL TOWN/TASMANIA arrival cds at left dated AP.15.91. H&G 2. AUSTRALIA (Tasmania) - 1884 1d PSC used locally from NEW NORFOLK. H&G 2. 1884-89 1d carmine-rose on white postal stationery postcard addressed locally cancelled by light '63' duplex with NEW NORFOLK/TASMANIA cds below dated JU.3.95. H&G 2. AUSTRALIA (Tasmania) - 1884 4d RPSE unused. H&G 2a. 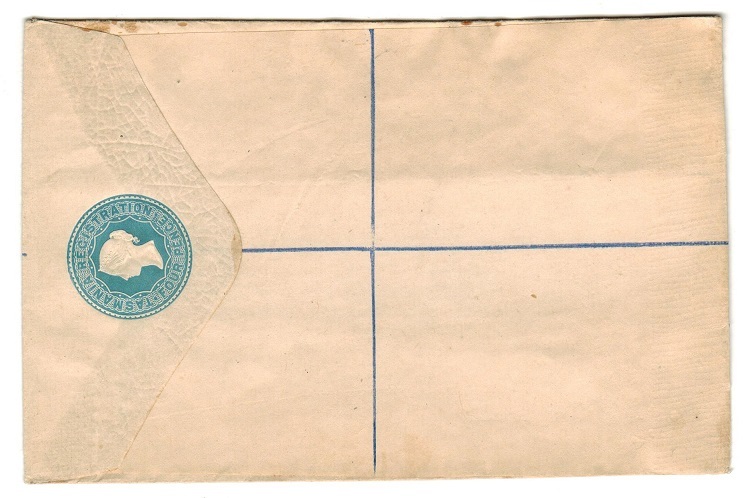 1884 4d blue on cream 'M'Corquodale' registered postal stationery envelope (size G) in mint condition but with surface creasing on reverse side. H&G 2a. AUSTRALIA (Tasmania) - 1907 local 2d rate cover used at RINGAROOMA. 1907 (JU.3.) cover addressed locally bearing 2d tied by RINGAROOMA/TAS cds. AUSTRALIA (Tasmania) - 1898 2 1/2d red-violet illustrated 'view' envelope. H&G 3. 1898 2 1/2d Red violet on white laid paper postal stationery illustrated 'view' envelope in fine unused condition. (No.306/Dianas Basin & St.Patricks Head). Scarce. H&G 3. 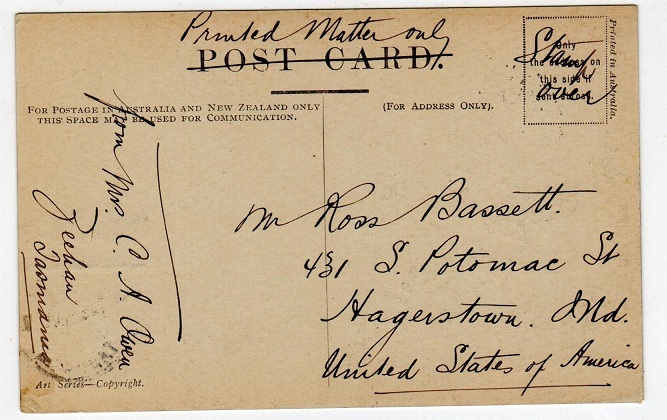 AUSTRALIA (Tasmania) - 1907 use of picture postcard to USA from ZEEHAN/TASMANIA. 1907 (DE.11.) 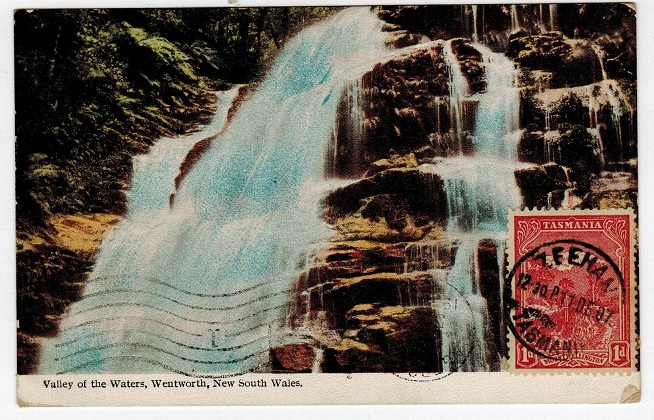 use of picture postcard addressed to USA depicting 'Valley Of The Waters, Wentworth, NSW' bearing 1d 'pictorial' adhesive tied ZEEHAN/TASMANIA. AUSTRALIA (Tasmania) 1918 5d on £1 orange and green REVENUE mint. 1918-19 5d on £1 Orange and green. A superb fresh mint example of the (SG type 20) ovpt'd REVENUE. Barefoot and Hall 53. AUSTRALIA (Tasmania) - 1903 1d on 3d REVENUE mint with SURCHARGE INVERTED. 1903 1d on 3d chestnut REVENUE adhesive in very fine mint condition (type C) with the major variety SURCHARGE INVERTED. Barefoot & Hall 31a. 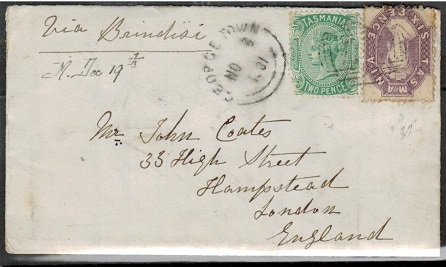 AUSTRALIA (Tasmania) - 1862 6d on cover to UK with red POST OFFICE/LAUNCESTOR cancel. 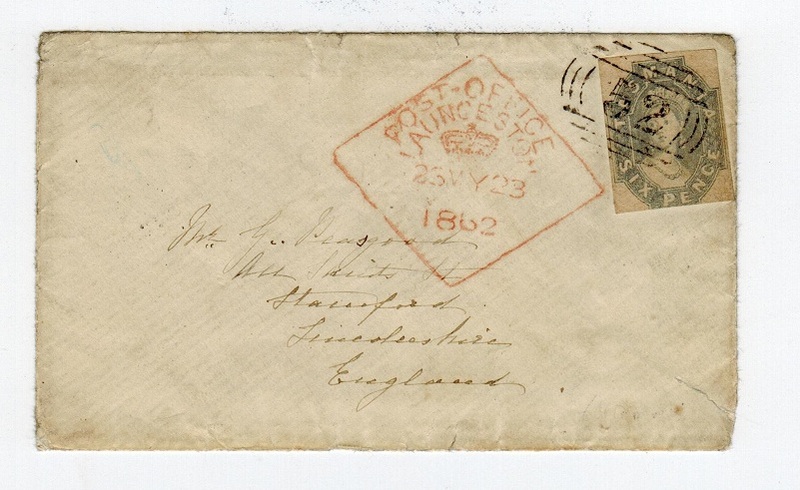 1862 cover addressed to UK bearing 6d dull slate grey adhesive (SG 44) cut square and just touched at bottom, tied by very fine ' 52 ' duplex with fine red crowned boxed POST OFFICE/LAUNCESTOR cancel at left dated 23.MY.23/1862. A fine early cover. Duplex 52 was allocated to Ross in the first allocation but came to be used at Launcestor from 1861.